I love the colors in this rug. 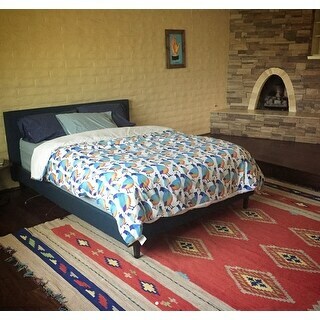 The rug resembles a kilim and looks much more expensive than the cost. Also, it was delivered in less than 2 days after I placed my order. I am completely pleased with my purchase. 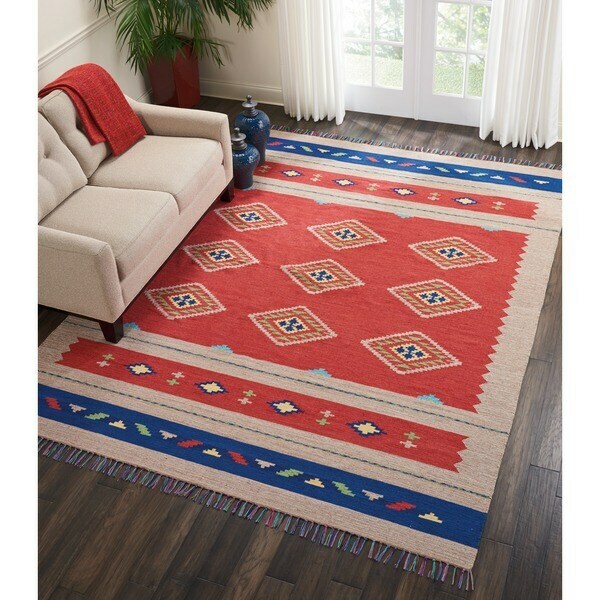 Emphasize the Southwestern decor in your home when you lay down this area rug boasting Ikat patterns. A blend of cotton, acrylic, and polyester makes this red and beige rug sturdy enough for moderately busy spaces. Can’t believe the price of this cheerfully patterned, brightly toned flat-weave cotton rug. Perfect in my son’s room. Even better with a thick non-slip rug pad. A bit thin, strong rug though. It looks good in my family room. I like the colors and the price.